This presentation was delivered in live webinar format in 2015. Ron’s comments have been edited for clarity and length. What will someone’s healthcare costs be in retirement? 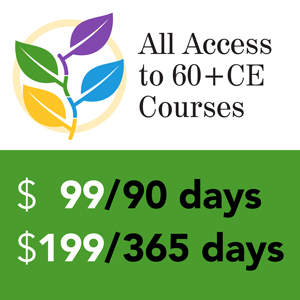 Is there an effective way to manage those costs? Yes. There’s actually a lot we can do to both manage the costs, determine what needs to be saved today, and ultimately for a large percentage of your clients, you can actually help lower those costs. You can do this by not only looking at asset allocation, but also product mix. Product mix today is as important as asset allocation was 10 – 15 years ago. Let’s begin by giving covering the basics. Medicare is broken down into five parts. Medicare Part A, which is hospitalization. As advisors we don’t need to know much more than this, unless we’re in the business of providing clients with insurance coverage in retirement. 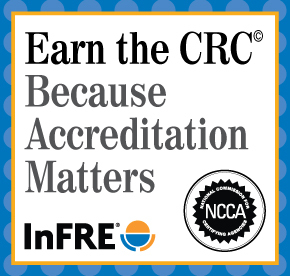 Very few of your clients will actually be paying for this because we’re paying for it now through our FICA tax, so that’s prepaid. Medicare Part B covers doctor visits, emergency room visits, tests and things of that nature. Supplemental policies, or Medigap insurance. Mainly because since Medicare covers about half of someone’s medical expenses, future retirees will need to go out and purchase additional insurance to actually cover the remaining costs. In addition to the general Medigap policies, there’s Medicare Advantage, which is a combination of Medicare’s Part A, B, and D. There’s a lot of variations. The difference between Medigap and Medicare Advantage is that Medicare Advantage is primarily an HMO, where Medigap is primarily a PPO. So that’s basically what we need to know as advisors. As advisors, do we really need to address healthcare? Don’t we have enough on our plates? The reality is that affluent Americans are interested in addressing this issue. When I first started HealthView Services, I thought this would be a mass market type product. We’ve learned since that there’s no correlation between what someone earns, or what someone has in assets, and their level of interest in addressing healthcare costs. Why All the Fuss about Retirement Healthcare? When we review the expenditures of people over the age of 60, you’ll see that housing, food, and transportation add up to 34 percent, which is basically what we will be spending on healthcare. So when we’re looking at the financial planning process, if we’re not truly addressing healthcare it is a true void. I’ve always thought that Social Security benefits would cover my housing, food, transportation for as long as I can drive, as well as healthcare. The reality is when you’re looking at the numbers based upon different levels of monthly income and Social Security, you can clearly see how much healthcare will eat up of our Social Security checks. For example, at age 86, healthcare costs might be around $26,000 in real dollars. However, if someone is at the high end of Social Security benefits, they will also be paying Medicare surcharges. In reality, healthcare will be a lot higher than that $26,000; it could be double. That’s an important number to remember and we’ll get into that in a little more detail. Another question that I get quite often is, “I’m a Baby Boomer, so why all this focus on healthcare? My parents really never had much of a problem living on Medicare and Social Security. Why is it such an issue today?” First of all, let’s take pensions right off the table. As you know, unless you’re in the public sector, pensions are going away. Let’s compare both generations and take an average American couple, where in 2015 they’ll generate around $26,000 from Social Security income. The lifetime Social Security benefits for the Greatest Generation were around a $1.1-$1.2 million, and the average COLA was around 4.5 percent. The average projected COLA by the trustees at Medicare going forward is 2.7 percent. We have not seen 2 percent COLA in quite a while, but let’s assume that’s correct and it’s going to be 2.5 percent. That means today’s retiree earning the same level of income as the Great Generation will generate a little over $900,000. In other words, we’ll have less benefits of around $250,000 comparing one generation to the next. Secondly, if you have clients from the Greatest Generation, most of your clients did not pay for supplemental insurance. They also didn’t pay for drug insurance; they didn’t pay those premiums. My dad worked at Raytheon, and he was not a senior manager. He was just an average guy working at Raytheon, and never had to pay for supplemental insurance or prescription drug premiums, because Raytheon picked that up. Today, our clients in the private sector, they’re paying those bills out of pocket. If I compare that difference, just looking at prescription drugs and supplemental insurance, I’m looking at additional costs or net less benefits of another $260,000 – $270,000 than what the Greatest Generation received. By the way, I did not take Medicare surcharges into account. 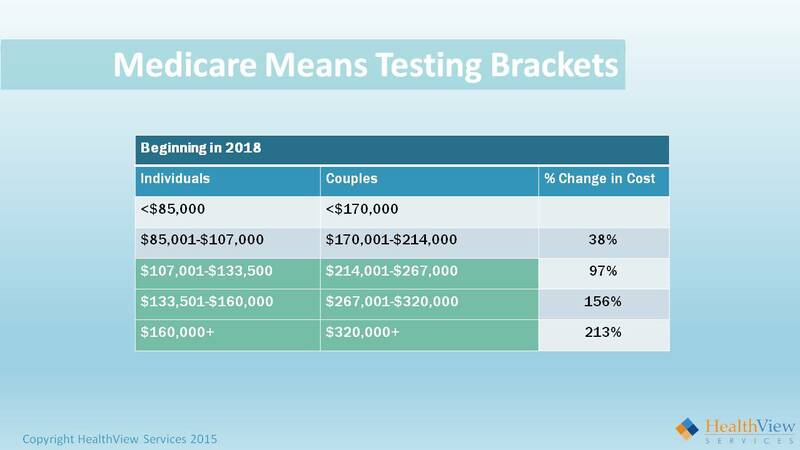 Approximately half of your clients will get hit with Medicare surcharges, and that’s not accounted for here. As time goes on we will be more and more responsible for our own healthcare expenses. Deductibles for preretirement commercial insurance have increased by some 50 percent over the last ten years. That trend is also going to impact retirees. Approximately 20 percent of the working population is in a high deductable plan. You’re going to start seeing those types of changes in retirement as well. Inflation is probably the biggest killer when it comes to healthcare. We’re projecting in 6 – 6.5 percent inflation rate on healthcare. We’re going to be living longer. That will impact our costs, so there’s good news and bad news. Many of us use income replacement ratios, whether it’s a top down approach or a bottom up approach, but there are issues that we need to address with income replacement ratios because healthcare is not one number. Depending upon where you live, healthcare costs are very different. States are looking at how they can potentially lower medical inflation rates because of the impact it’s having on their economies. This is a critical issue both nationally and within the state that you live in. I’m not sure we have answers to this. Every year our Social Security income is actually decreasing. For those of us who thought that Social Security would be paying for all our expenses, that may have been the case years ago, but it’s not going to be the case today. As a matter of fact, a 65-year-old male retiring a year from now is going to need to allocate over 65 percent of their Social Security check to healthcare alone because of Medicare surcharges. For the average American couple retiring in ten years, it’s 73 percent of their check. So your average 55-year-old retiring at age 65 before taxes is going to be paying 73 percent of their Social Security check to healthcare. Over 50 percent of Americans are going to be paying taxes on Social Security income. What’s left? The Society of Actuaries recently concluded that we’re going to live a couple of years longer. That’s a good thing. If we’re going to live a couple years longer, what does that mean in terms of healthcare costs? If we take a 55-year-old living an average lifespan, those two extra years will cost that person $73,000 in real dollars. If I take the net present value of that, you’re looking at around $35,000. When planning, utilizing realistic life expectancies can make a difference in terms of lifestyle. Say we have two 55-year-old males living in Illinois, mirror images of each other. One happens to have Type 2 diabetes, and the other one is healthy. They’re both going to retire at the exact same time on the same day. The person with diabetes has a life expectancy of 77, so they’re looking at around the $190,000 in total healthcare costs. The 55-year-old healthy individual is going to live ten years longer, and their costs will be over $430,000. You’re looking at a $245,000 difference because of those ten years. Then add the impact of compounding that inflation rate at 6 percent a year. 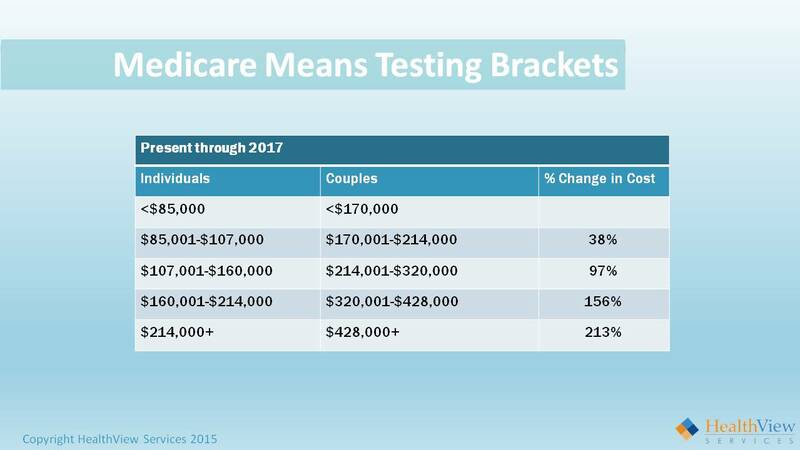 Probably one of the most important things that we can have an impact on for our clients happens to be Medicare means testing, or surcharges. The system has been designed today to charge for Medicare Part B doctor visits and Medicare Part D prescription drugs based on income level. Income level is defined by Medicare as Modified Adjusted Gross Income (MAGI). So very specifically, you may have a client that’s heavily invested in municipal bonds, and they’re not paying taxes on that. Guess what? It does fall under MAGI. So a key number for all of us to be looking at is that MAGI number, because it can impact medical costs by up to 200 percent. So Medicare parts B and D are means tested. There’s one problem with that not being a problem. Back in 1983, a bill was signed into law that taxed Social Security. We all know that if you earn over a certain threshold, you will pay taxes on Social Security benefits. At that time, around 5 percent of retirees paid taxes on Social Security. That threshold was not indexed to inflation. Today well over 50 percent of retirees are paying taxes on their Social Security, and I’m just talking about the general public. In your client base, the vast majority are probably paying taxes on Social Security. These brackets are not indexed to inflation. So as time goes on, more and more people fall into these brackets. Congress recently passed a bill called the Doc Fix Bill, which ensured that physicians get paid, which was very important from a Medicare perspective. Buried in that bill were the brackets for Medicare means testing. For example, the top bracket for individuals starts at $160,000. This begins in 2018. It’s currently $214,000. So the brackets are getting lowered. They’re going to continue to get lowered as more and more people fall into these brackets because the trust fund is being depleted. Now let’s take an individual earning $40,000 a year, who is never going to earn more than the equivalent of $40,000 a year. When they retire, they will be hit with a 38 percent surcharge on average depending upon which state they live in. So if that person earns one dollar over $85,000, they’ll pay a 38 percent premium. 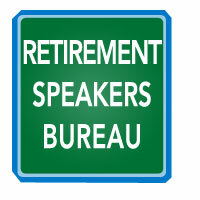 A retiree today can be in the first bracket and ten years from now they can be in the third bracket. 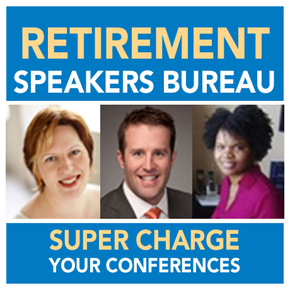 How Can Advisors Help Manage Medicare Surcharges? Let’s take an example of a 55-year-old couple retiring at 65. They have a half a million dollars invested with you and they’re in a 60/40 portfolio that is generating a 6 percent return. Assume they’re going to generate a 6 percent return for the next ten years, or around $400,000 in gains. In less than an hour, you can save that client anywhere between $150,000 and almost $900,000 by managing their product mix around the MAGI thresholds. Today it’s become part of our jobs to not only look at risk tolerance, time horizon, and the right asset allocation, but also the right product mix because it can generate an additional hundreds of thousands of dollars in disposable income in retirement. Income replacement ratios as we all know, address future costs based on today’s costs. While employed, the average American pays 25 percent of the actual healthcare premium costs, and employers pay 75 percent of that cost. Plus we pay all of the out of pocket, like co-pays and things of that nature. In retirement we’ll be paying 100 percent, not 25 percent, so it’s important even when performing traditional planning to really take into account how much of healthcare you really have covered, and what’s that additional gap? We’ve found that advisors who take this approach and call their clients back in, the client appreciates it because it’s such an important issue for them. Another issue is state of residence. Both supplemental insurance and prescription drugs are coverages are managed by the states. The state determines which vendors can sell those products in that state. They select the products and then negotiate the pricing. If I compare Massachusetts to Hawaii for the exact same product, you’re looking at $150,000 difference in out of pocket costs. It’s a 50 percent differential for the exact same product. Let’s take it one step further. Let’s say I’m in the state of Massachusetts and I’m buying a particular supplemental policy. Let’s say I’m buying F, which happens to be the most popular supplemental policy. And let’s say there are five firms in the state of Massachusetts selling F. They all have different prices. But guess what? By the law the coverage is exactly the same. There cannot be any difference in coverage. The only difference can be price. The issue arises when you have a client who may own a home in another state; the question becomes, “Where do you live?” Maybe healthcare becomes one of the variables that that particular client would want to consider in making that decision. The differential between healthcare costs of the last year of employment and the first year of retirement given U.S. averages, ranges from $3,000 to almost $9,000 more in retirement than we had as an employee. The one big difference here is that it’s not coming out of our paychecks. We’re writing a check. Let’s take a 55-year-old married couple. They want to retire at 65. The male has a life expectancy of 87. The female has a life expectancy of 89. They’re both healthy. They’re projecting an income replacement ratio income of around $180,000 in retirement. They live in Northern Massachusetts, and they also have a home in Kennebunkport, Maine, which is approximately 40 minutes from where they live. So the question becomes, “Where should they live?” They’re not sure whether they’d want to live in Maine or Massachusetts when they retire. If we just look at the basics, the hospitalization piece is already prepaid. For doctors and tests, it doesn’t matter where you live. It’s run by the federal government and that’s consistent. So Part B is consistent across the country. It’s important to realize that Medicare premium is directly deducted from Social Security checks; the Feds are not sending us bills. Prescription drugs and gap insurance is run by the states. So now let’s look at the difference in costs between Massachusetts and Maine for this couple. In Massachusetts they can expect costs of around $885,000 for healthcare in retirement, that’s in future value; and in Maine, $819,000. So you’re looking at around a $64,000-$65,000 differential. In their case, why pay the differential? They’re just as happy in Maine as they are in Massachusetts. The difference is gap insurance. By the way, at $180,000 they’re in the second income bracket, so there’s an additional surcharge of $87, 000 over time. For simplicity’s sake, this could be done with an annuity as well as 401(k). In this case the advisor recommends that they convert their traditional 401(k) into a Roth 401(k) and that drops them into the first Medicare bracket. All of a sudden they’ve saved the $87,000, and they saved the $64,000 – $65,000 – just like that! The next thing for this particular couple is they’ve decided they’re going to sell the house in Massachusetts. They will need to sell that house at least two years prior to retirement because Medicare has a two year look back. All those capital gains from the sale of the house can move someone from one bracket to another because it falls under MAGI. In sum, what did we find here? The total cost in Massachusetts is $885,000. By moving to Maine, they reduce to cost to $820,000. Converting to a Roth 401(k) lowers the healthcare costs to $660,000. Now we have just lowered healthcare expense from $885,000 to $660,000. However, $218,000 of what they need will be coming directly out of their Social Security. If they invest $40,000 today at age 55 into an account assuming a 6 percent return during their lifespan, that lowers the cost of healthcare to $285,000. Additionally, if they allocate $10,000 a year for five years while working in retirement, they’ll lower their savings requirement to around $138,000, based on a 6 percent return. In this case study we’ve saved this particular client over $224,000, and we’ve increased Social Security income by close to $160,000 because those surcharges will not come out of their Social Security benefits since we moved them from the second bracket into the first bracket. We’ve optimized retirement income and the required savings decreased by $68,000. From a consumer’s standpoint, a third of what they’re going to spend in retirement is going to go to healthcare. We’re behind the eight ball in our generation in comparison to the previous generation. We need to make that up. The way we have to do it is to save. I also strongly recommend that investors talk to an advisor as early as possible to begin a program to specifically address healthcare, and don’t forget Social Security optimization. It could mean hundreds of thousands of dollars in additional income. From an advisor’s perspective, folks are interested in healthcare costs and Social Security, and we as advisors need to address it. We need to understand how to overcome some of the roadblocks, such as inflation and limited COLAs. Educate yourself. You don’t need a degree from Cal Tech. Learn the basics and utilize applications such as the HealthView’s HealthWealth Link that will help you get to the numbers that your clients need to save. You can lower those healthcare costs through product mix; it’s not just asset allocation. It’s a mix of insurance and capital market products and optimizing that mix to optimize retirement income. Click on the following link to get a free trial of HealthView which includes both education and a host of different retirement related applications. Want Ron Mastrogiovanni to speak at your event? 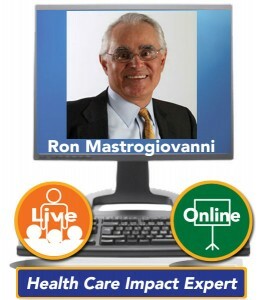 Ron Mastrogiovanni, President and Chief Executive Officer of HealthView Services, has more than 25 years of experience in management consulting, financial services and health care software design. Ron is responsible for developing the HealthView software platform, a solution-based planning system that integrates health care cost projections, Medicare means testing, long-term care expenses and Social Security optimization into the retirement planning process. Ron is President and Chief Executive Officer of HealthView Services, which he has helped guide to strong growth, leading the way to innovative new retirement planning applications. Prior to HealthView, Ron was the co-founder of FundQuest, one of the first fee-based asset management companies that provided financial institutions – including banks, insurance companies, and brokerage firms – with wealth management solutions. Ron’s strategic planning, innovative product design and general business experience led FundQuest to become one of the most successful fee-based money management solutions in the industry. Under Ron’s leadership, the company accumulated over $12 billion in assets. The company was acquired by BNP Paribas, a global leader in banking and financial services. Previous to co-founding FundQuest, Ron was President of The Parker Company, a management consulting firm specializing in technology startups. Prior to The Parker Company, he held senior sales and marketing positions in the technology industry.